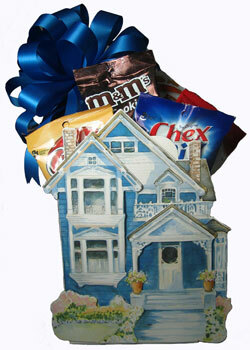 The bay windows and front porch area are slightly raised for a 3d effect in this blue victorian cottage house gift basket. Filled with Cookies, Snacks, Chocolate Bars, and more. Wrapped in crisp clear cellophane and topped off with a big beautiful handmade bow. Includes a Handwritten Enclosure Card. Finished decorated design approx. 21"H x 14"W.